We wanted to take a trip we truly felt we wouldn’t get the chance to take again in our lifetimes – a destination that would not only be exciting for us, but a place that would easily give us stories to share for years to come. Martin is from Buenos Aires, Argentina. I’m from a smaller city in Texas. We met in Argentina and both enjoy atypical escapades (our first date was a 15K race). We had decided to honeymoon for a month, so we wanted to take advantage of having such ample time off. Growing up, I had heard stories about the Trans-Siberan Railway through Russia/Siberia. 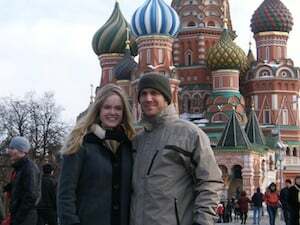 Since the honeymoon dates would be most of March and the first week of April, I felt Russia would not be unbearably cold yet still with the chill and late-winter snow that would make it breathtaking. I mentioned the idea to Martin, and we were immediately hooked. And while we were over there, why not throw in Mongolia and China as well?! Hence our Oriental-Siberian Adventure. Since we were planning to marry in Argentina, I had many family and friends who were not easily able to give us tangible gifts from a traditional wedding list. Shipping to Argentina is a hassle, not to mention the extra cost. The idea of opening a bank account and having people deposit money wasn’t even an option for us; it seemed much to cold and curt. I had heard of honeymoon gift registries, and I pored over the boards on The Knot investigating our alternatives. There seemed to be many options, but in the end we chose Traveler’s Joy specifically because we liked the look of the website, its user-friendliness, and the fact that it allowed us to upload the photo of our choice for each item on the list. We really appreciated this feature because it seemed to make our page much more personal. So the destinations and dates were decided upon; we would travel most of March and the first week of April. We purchased our tickets through British Airways, which ended up having the best airfare price for our multi-city trip at $1,600 per person. The plan was to travel from Buenos Aires to Moscow, make our way across Siberia by train, eventually head south to China, and fly out of Beijing back to Buenos Aires. We were ecstatic to put together our itinerary’s first draft and couldn’t wait to get our honeymoon registry up and running! Right away we got so many compliments on our registry page, and we were so thrilled that people seemed to easily accept this form of gift-giving. Even though we had expected the honeymoon registry to be an option for the wedding guests stateside, it ended up being a hit with the Argentines as well, and we were happy to see that there were no problems purchasing with international credit cards. Part of us feels as though the guests were so enthusiastic about our itinerary that they ended up giving more than they would have from a traditional wedding list. We were amazed at everyone’s generosity and willingness to make our honeymoon dream come true! As we received email after email of new gifts received on the registry, we felt more and more confident that this honeymoon was really going to happen! We had a blast researching accommodation, travel, entertainment, etc. to continue adding to the registry list. We used Booking.com for a lot of the hotel reservations and TripAdvisor as a go-to research tool. I had also ordered the Trans-Siberian Handbook by Bryn Thomas from Amazon which we later referred to as our bible throughout the trip. The week we had all been preparing for so long finally arrived. The wedding was beautiful and the reception was a hit, and as the sun rose on our first full day as Sr. and Sra., we were giddy thinking about our adventure that awaited us only three days later. We bid goodbye to our family and friends and boarded the first leg of the journey. We had bought a CD and phrasebook to help us learn a bit of Russian, and about 18 hours later, we landed in Moscow with a few expressions under our belt. I am a huge fan of public transportation, and my new husband found this out in the most extreme sense on our honeymoon. After a groggy connection from the airport to a train to the Metpo (Moscow subway), we dragged ourselves through the mesmerizing streets of Moscow until we reached our beautiful hotel and exhaled. It was late and we crashed, but not until after room service knocked on our door with a beautiful cake that I had previously ordered for Martin’s birthday, which happened to be the first on-location day of our honeymoon. It was early March and Moscow was indeed cold, but I couldn’t imagine visiting Russia without snow. We had chosen the Budapest Hotel in Moscow because of its location, large rooms, and older style. We gallivanted around the city visiting must-see spots including the Kremlin, Red Square, and the infamous onion-domes of St. Basil’s Cathedral. We took advantage of Moscow’s incredible selection of dining venues, trying everything from regional dishes such as Borscht (beet soup) and Pirozhki (stuffed buns) in an underground tavern to Arab cuisine at a belly-dancing venue. Surprise! We also stepped off the beaten track, taking a Metpo ride to a suburban market outside the city where we watched the vendors sell everything under the sun then crossed over to a picturesque snow-filled park where we took in some cross-country skiing. Before we left Moscow, we visited the Sandunovskiye Baths, a traditional bathhouse where we were customarily separated and Martin ended up with the best story: a naked man in the sauna asking him to beat his back with a birch branch. Truly. After a successful first stint, it was time to head north to St. Petersburg. Buying tickets at the train station is a story in itself; let’s just say our previously-mentioned phrasebook and “bible” saved us! We took an eight-hour overnight train ride to St. Petersburg. Upon arrival in the early morning, we learned our first lesson in train etiquette: Don’t dolly on the train when it’s time to get off! After navigating the St. Petersburg Metpo, we arrived at our very peaceful Tradition Hotel, an interesting choice across the frozen Neva River. The hotel was much smaller and intimate than the previous Moscow choice, and we instantly fell in love with its quaintness. We got a kick out of the heated floors in our bathroom and soon bundled up in order to visit the Hermitage Museum where we explored the largest collection of paintings in the world all housed inside the former Winter Palace of the Russian emperors. Walking around this charming city with its frozen canals, we were constantly reminded to dodge the icicles dangling down from roofs over our heads. It was amazing to see people looking up instead of down while trying to watch where they walked! We bought tickets to a classical music concert and then felt as though we were on a scavenger hunt through the city after first going to the wrong theater. Yet I will always stand by my opinion that getting lost someplace new is the best way to explore. 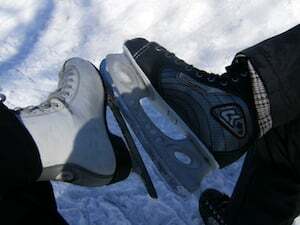 On our last day, we went north of the city to a beautiful snow-filled park where we rented skates to strut our stuff on their outdoor ice rink! We had a few hours back in Moscow before embarking on the 5,000 km (a little over 3,000 miles) train ride through Siberia. We spent the majority of that time checking account balances back home at an internet café where we were surrounded in the early morning hours by young boys and men alike who had fallen asleep at some point during the night at their computer terminals. After a last-minute trip to the large grocery store across from the train station, we were ready to board the #350 headed east. Our trip was not on the international non-stop Trans-Siberian train since we wanted to actually get off in the middle of Siberia. Therefore, it was a national service and there was not one tourist to be seen. The only option for train cars was 2nd class (4-berth compartments with a sliding door) or 3rd class (train cars that looked like small hostels when you walked through them: bunk beds lined up and down the whole car). We chose 2nd class and our first “roommates” were two Russian women who seemed to hit it off right away and mostly left us alone after a few random gracious smiles and offerings of cigarettes. The train made frequent stops outside Moscow to let passengers on and off, and both women got off the first day. One was replaced by a very kind, middle-aged woman named Natash who proceeded to share our compartment the following four days until we got off. The fourth bed was occupied 50% of the time by random shorter-distance goers. So many people have asked us, “WHAT did you do on a train for five days? !” Well, mostly, we RELAXED! We stared at Siberia rolling past us with its cold, mysterious landscapes and drank tea. We amused ourselves trying to pick up a few words of our fellow passengers’ conversations. We read. We slept. We wrote in our journals. We filled up our lookalike Cup ‘O Noodles with the train car’s communal hot water vat. We made up stories about the two female car attendants who took shift turns selling tea and vacuuming. We read about the different villages we passed in our “bible” and watched the schedule closely for upcoming stops in order to get off and stretch our legs and buy fresh bread, cookies, water, and beer from the vendors at the tiny village stations. Before we knew it, it really was time to say good bye to Natash and our lovely attendants (one of whom had developed a cute crush on Martin) and make our way into the small city of Irkutsk, Russia. We were now smack dab in the middle of Siberia, albeit a bit more south and very close to the Mongolian border. Our idea in Irkutsk was to pay a visit to the Mongolian embassy where Martín was required to get a visa which could be dealt with in a matter of hours, according to our research. But what wasn’t part of our plans was the embassy being closed that very same day. Due to the visa mishap and highly possible incompatible train schedules in and out of Mongolia, we came to the conclusion that our itinerary was not going to work out. Instead, we hopped onto the world’s scariest minivan ride and exhaled after actually surviving the 35 minute roller coaster to Listvyanka on the banks of the world’s deepest and oldest lake, Lake Baikal. Listvyanka must have had a population of about 257 during the winter. We were drawn in by its stillness and booked three nights at a cabin motel where we were the only guests. Oh, did we mention that Lake Baikal was frozen over? That’s right…a layer of ice three meters thick covering the entire lake-that-looks-like-the-ocean. So thick that cars were driving on it and we eventually got the nerve to walk on it, then “skate” on it, and then lie down and make ice angels on it. We ventured uphill above our motel where we found a mini ski slope and became Siberian ski bunnies for a few hours. The only meal outside our cabin was our hunt to find a place serving omul, the local fish. After having the tiny town to ourselves for three whole days, it was time to return to the real world, sort of, and we soon found ourselves at the Irkutsk airport awaiting a flight to Beijing. One of the craziest anecdotes from our honeymoon was the arrival to our hotel in Beijing. We made it fine from the airport to the city center by bus, and then the action started. At around 10:00 p.m., we got into a taxi with the address to our destination: an authentic Chinese courtyard guest house. Between 10:10 p.m. and 1:00 a.m., we rode around with our taxi driver in circles trying to find this place that seemed to be imaginary. Maps were pointed at, numbers were dialed, terrible attempts at speaking Chinese were made, voices were raised, cigarettes were smoked, and no one understood anything. Three hours later, we were in the middle of a hutong, Beijing’s famous mazes of narrow alleyways where even our taxi couldn’t fit, and a young Chinese woman came walking up to the cab and spoke English to us. She confirmed we were the lost couple looking for the Autumn Garden Hotel, and we nodded. We rounded this corner and that, and finally came to 2 broad red doors that opened up to a beautiful authentic Chinese courtyard home. After our laid-back Siberian “break,” we once again picked up the pace and hit all the “it” spots including Tiananmen Square and its adjacent Forbidden City, dating back to the Ming Dynasty in the early 15th century. We didn’t miss the must-eat meal, Peking Roast Duck, carved tableside and served in thin pancake-like wraps. We spent an entire misty but enlightening day at the only “untouristy” section of the Great Wall, reached only by a Michael Jackson “Thriller”-themed car ride given by a quiet woman who put a “taxi” sign in her front window as soon as she saw the misplaced tourists wandering around. She waited there three hours while we had The Wall completely to ourselves and then drove us back down to catch our bus into Beijing. From Beijing, we took an overnight train to Xi’an where we gawked at the Terracotta Army being uncovered before our eyes after resting underground for over 2,000 years. It was absolutely fascinating. We had decided to spend the last part of our honeymoon in southern China, focusing on the city of Guilin in the Guangxi Province. After a short flight, it was a completely different China. It was green, lush, and the air felt amazing. The Li River created a beautiful backdrop for evening walks near our small hotel, and we found the citizens to be incredibly friendly and curious. We toured picture-perfect rice fields in the surrounding mountains where we ate rice out of bamboo shoots and scurried along the narrow pathways with the roosters and village-dwellers alike. Another day, we took a four-seater bamboo raft down the Li River where eyes were constantly pointed upwards at the extraordinarily jagged, pointed, rock structures surrounding us. Sitting side by side, floating slowly down a peaceful river in southern China, it was hard to imagine departing for our side of the world in a matter of hours. And since those hours did end up flying by much too fast, we were granted one last honeymoon wish upon arrival at London Heathrow where a very nice fellow at the British Airways counter changed our tickets to keep us on our adventure three days longer: in London. Going over everything written here, it sounds like a trip we could have easily considered unimaginable before giving the idea a chance. Our four-week honeymoon ended up totaling $12,000, all costs figured, and we consider that to be a darn good deal for our first true adventure of a lifetime.